That’s right, tracing is not cheating. I used to believe it was, and there are many people who still do. That belief is wrong because it assumes you are copying what is being traced, but that’s just not true. Have you ever seen a hand-traced image that looks exactly like the original? No? I haven’t either. The reality is that tracing does not copy, instead it creates something new by re-purposing the existing image. Like drawing, tracing involves making artistic choices such as where to put lines and how detailed the image should be. Don’t let the “tracing is cheating” belief limit you. Embrace tracing for what it really is— a tool you can use in your creative process. I’m not saying you should trace everything, but that tracing is something you can use to further your process. There are many uses for tracing within art and design. For example, many people trace their own sketches, often to create multiple variations of an image. This works great for logos,layouts, illustrations and even animations. Photos can also be used, although the intent and approach is often very different. When using photos, don’t try to look at them as photos, because that will limit the image’s potential. Instead, look at photos as a reference to discover the subtlety and structure of your subject. Lastly, don’t feel that you have to keep tracing; if you learned something and feel you want to draw it by hand, take it to the computer or move in a completely different direction— GO FOR IT! 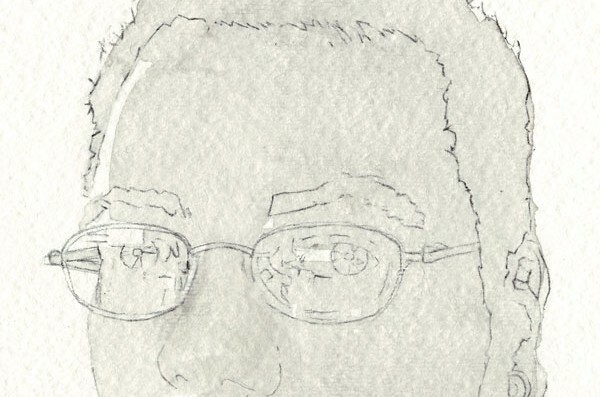 For this trace my goal is to create a line drawing that will be a loose, but reasonably detailed guide for my ink wash. I don’t want to be too literal and try to capture all the details, because I can always develop them later with wash. So I take a more figurative and loose approach, picking and developing the main details and structure of the image. I start by looking at which lines are the most important. That sounds easy, but often when I REALLY look and think, I discover new subleties, such as a person’s likeness. Then, as I start sketching I focus on how the lines contain the forms of the image. This is how my process generally works because I feel gives the trace it’s magic— it’s not a boring, detailed and un-inventive copy. Instead it’s something new. I encourage you to find your own approach to tracing in the same way I did, by experimenting and exploring. I am writing this tutorial from my approach, but don’t let that limit yours. You can trace from virtually any image including sketches and photos, but be careful as some images may have copyrights. Tracing from photos often requires some adjustments, depending on the use of the image and artistic preference. 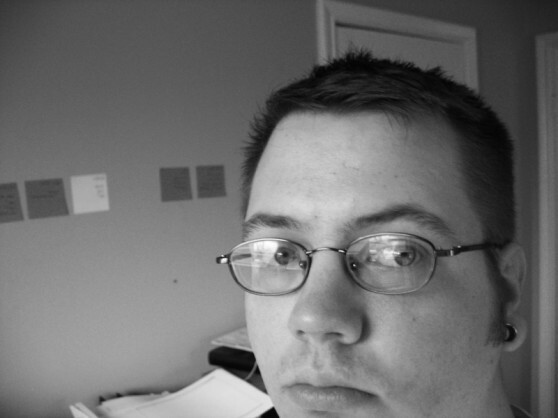 In general, if I’m using a photo I will first remove the color, making it a grayscale image. Then I adjust the contrast, brightness and exposure levels to fit my needs. I prefere higher contrast with washed out whites and deep blacks. I find this works best to see the details and value differences. Experiment with different adjustments to best fit your style and desired effect. Black and white image of me, after adjusting the contrast, brightness and exposure levels. After preparing your image, all you need are need tracing paper and a pencil. A light box also comes in handy, but if you are cheap like me, you can make due with a window or computer screen. If you are using a computer screen, be careful not to press hard, you don’t want to damage it. I use my laptop screen tilted back with a blank browser window (bright white) and it suits my needs just fine. Start by tracing your image to your liking, feel free to make multiples and scrap some. The next step is to transfer your image to your paper, preferably watercolor paper or even some printmaking papers will work nicely. If you have carbon transfer paper, then you probably know what to do already. If not there’s a simple method using only a soft pencil (2B and HB work great). Turn your trace over and trace again on the back, following the lines on the front. Feel free to leave out lines and details you might not want anymore. Then turn the trace back to the front and place it on your paper. You might want some tape to hold it down. Trace once more over the lines you made from the photo and remove the tracing paper. What you now have is a faint copy of your lines on heavy paper. You can now go over the lines with a pencil if you like, or leave them faint. 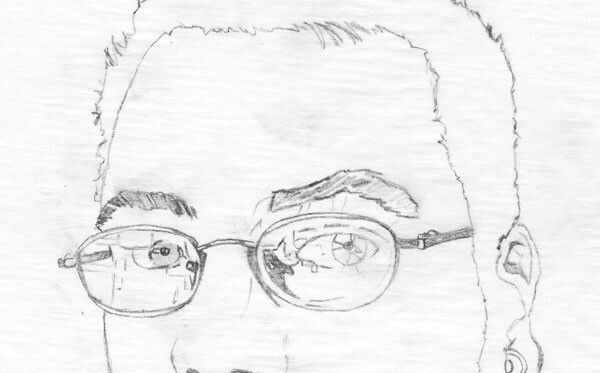 My final pencil trace before putting the image on watercolor paper. 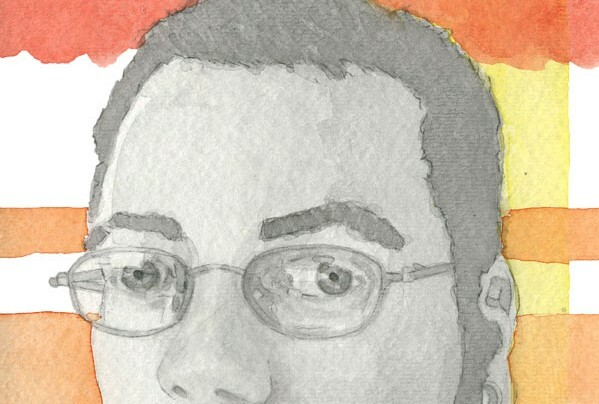 Ink wash and watercolor can appear to be very difficult, but mastering the basics can be easily done with a little experimentation and practice. I say experimentation and practice because there is no better way to learn. That is how I learned, by experimenting, observing and trying new things. If you have never used watercolor or ink wash, I suggest you start by reading a few books that have good demonstrations of basic techniques. Let these books serve only as launching points for your own explorations; nothing in them will make any real sense until you try for yourself, at which point you might start learning more than any book could teach. I could spend paragraphs explaining exactly how I made the image, but I won’t. Instead I will explain the principles of ink wash to guide you in your own experiments. There are a lot of ways to mix ink wash. One common method is to use watercolor pans to mix small amounts of wash. Generally, that tends to start your mixes on the darker side of the value scale because most often you are adding water to ink. One benefit of this method is that it gives you the space to make multiple shades for use. My method is different, but also common, in that it adds ink to a larger amount of water (the opposite of the pan method). I begin by filling a small jar with clean water, usually about a third full. Then I add about six drops of India Ink (I like the cheap bottles of Higgens india ink, the tops double as a dropper) and do a test wash. At this point the ink is pretty dilute, so I add more ink in incremental steps, testing between each. I usually add about three drops per increment, and test between each. When I start to get close to the shade I’m looking for, I stop and wait for the swatches to dry so I can see how they look after. I’ve found that inks dry just a little bit darker than they look when they are wet, which is typical of a lot of paints. You can continue mixing incrementally to the shade you would like to use. I usually stop between ten and twenty percent gray. This gives me a tone that both fills nicely and layers well to make darker shades. Experiment with whatever suits your style and purpose. Ink wash works exactly the same as watercolor; pigments are suspended in water and then “washed” onto the support (paper). There are many kinds of washes to create a variety of effects including wet-on-wet, wet-on-dry, and many gradation techniques. All of these techniques depend on three factors; the amount of wash used, the dryness of the paper, and the movement of pigments as they settle and dry. The first two are things that can be controlled by loading your brush with more or less pigments or by wetting the paper (or letting it dry). You should also be aware of how the pigments act on the surface and texture of your paper; always test your paper by making swatches and observing how the pigment settles, mixes and dries. When you make washes, keep these things in mind and try to use them to your advantage. The first basic wash is a flat wash. It’s simple but takes some practice. To do this, load your brush and spread the wash evenly over an area of dry paper. Try not to go back over areas that have already been covered as you spread the pigment around. Depending on how the wash flows and spreads, two different effects can be produced. If you spread it evenly without allowing the liquid to pool, then it will dry to an even tone. Allowing pools to form will cause more pigments to settle at the edges, creating gradations of tone. This can be compared to how a drop of pigment dries— dark at the edges and light in the center. Controlling the spread and flow of the wash takes awareness and practice. If you have trouble controling this, a paper towel or dry brush can be used to collect excess wash, and a wet brush can add more. The second basic wash is the wet-on-wet technique. Start by wetting the area to be painted with clean water. Carefully load your brush and then start painting it into the wet area. The color will start to bleed and create gradations of tone depending on where you lay the wash and how wet or dry the paper is. This can be tricky and unpredictable, but that is what makes it look real and organic, and you can learn to control it more through practice. 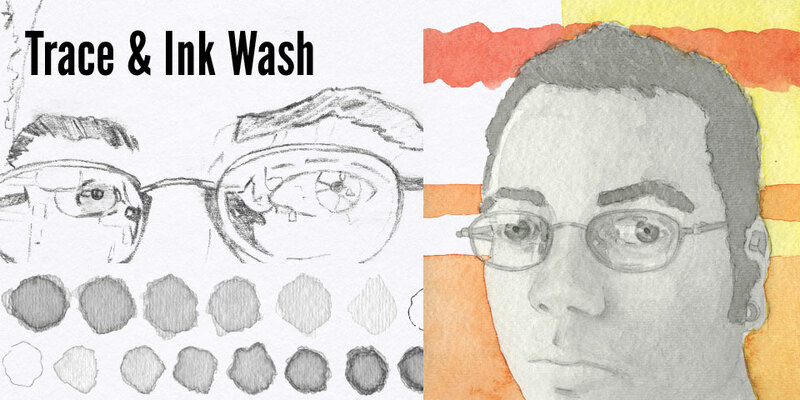 Combining these two basic wash techniques, and variations between, will produce a variety of effects. You should practice and experiment with both to learn to use and control the water’s natural behavior. The beauty of using a light-gray ink wash is that you can gradually build up values by layering washes. This consists of putting down a wash, allowing it to dry, and then putting another wash on top. Below I have included a value scale I made with the ink mixed earlier. Both scales were made by layering flat washes of light-gray. The first step on each scale is white, or the color of the paper, and does not have any wash. The second step is one layer of my wash, the third is two layers, the fourth is three layers… and so on down the scale. Here I made two scales to show the difference in wash tone. In the top scale I used an even wash with no pooling ink, and so the swatches have an even tone. In the bottom scale I allowed the ink to pool on the surface, and so the swatches are darker around the edges. A simple value scale created by layering washes of light-gray. With some basics down and nice gray wash mixed, you’re ready to start painting. The method I’m going to describe is my technique for layering ink wash to create multiple values. It can be both simple and complex, and I encourage you to deviate from it to find your own technique. Get out your transfered image and stop. Looking at the original photo, note the places that you want to be white, in this case the color of the paper. Put down a flat wash in all the places you don’t want to be white. In my drawing these include the glare on my glasses and the background. Now wait, and this is important, until it is COMPLETELY dry. Before you start your next layer, note the places you want to be the gray of the previous layer. Paint your next layer avoiding those places, dry and repeat, getting darker with each additional layer. Do this until you have reached the darkest value you would like in your image and feel free to go back into areas and detail or darken more. After many layers and time waiting to dry, I felt satisfied with my portrait. Still, I found the background to be a little boring, so I added some watercolor and then cut the paper down to the final image. I thought I was done… but wait. Now that you have an original piece of art, you can scan it at high resolution or have high-quality photos taken. My piece was small enough to fit on a scanner, so I scanned it and made some adjustments in photoshop. Then I saved it for future use. Because it’s digital I can now remove things or copy specific pieces into other works, such as layouts. And there you have it, a work of fine art, and a digitized copy, so have fun! Really liked the tracing process and all other advices, thanks.